Recently, Bean has been reading the Harry Potter books. He loves them, and has become obsessed with all things Harry. 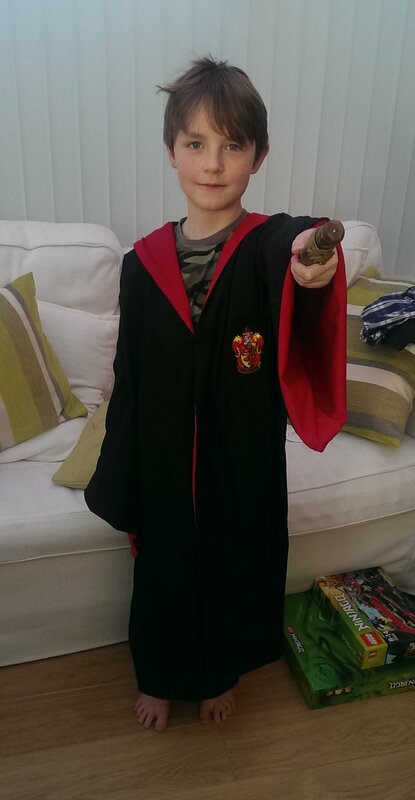 He mentioned that he would like some robes like Harry’s and so I set about finding a pattern to make them. It was hard work – there are lots of patterns out there, but many of them are generic wizard robes, or are not right in some other way – and Bean has an eye for detail, so they had to be right. In the end, I did find the perfect pattern, perfect in every way except the fact that it didn’t include an actual pattern – it had instructions, and the number and shape of the pieces required, and what measurements I would need to take, but nothing concrete. And so it was that I set about drawing and making the pattern from the children’s roll of drawing paper once they were in bed. Making the robes was done on two days when Stonelaughter was able to take the children out of the house so I could have a few hours of peace to get on with it. I was certainly very nervous about making these – I wouldn’t say I was proficient with a sewing machine, although I am getting better! As it was, I was finishing the last bit of hand stitching at 11pm on Christmas Eve … nothing like leaving things to the last minute! I’m very pleased with them, but I don’t think I’m in any hurry to repeat the experience!